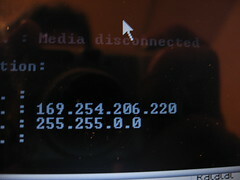 Most home computers connect to the Internet through a Dynamic Host Configuration Protocol (DHCP) server. This means the IP address is automatically assigned by the server (most likely your router). IP addresses are automatically assigned (leased) for a time determined by your ISP. The time varies, depending on the ISP. When your lease expires you lose your internet connection. The easiest way to avoid having your IP address expire and losing the internet connection is to turn off your computer at night, so that when you turn it back on the next day, the IP address is automatically renewed. Another way to restore the internet connection, is to click START, RUN, type cmd and press Enter. This will take you into MS-DOS. At the command prompt, type ipconfig /release and press Enter. Next, type ipconfig /renew and press Enter. Be sure to hit the space bar after typing the ipconfig command.